Are you working on your own game? Or want to learn logo design in an structured but fun way? After creating many courses on game art design, students told me that designing a game logo is a task it s hard to undertake. They think they lack two things: the creativity for logo design, and the technical skills to create a professional looking logo. Creativity is not a magical thing! It is not made by unicorns, it is created during the design process! We all have ideas we just have to get them out of our heads! This is what I actually cover in the first section of the course, and how we go through all the lessons of designing various logos. And when we have the basics, we will build those technical skills as well! 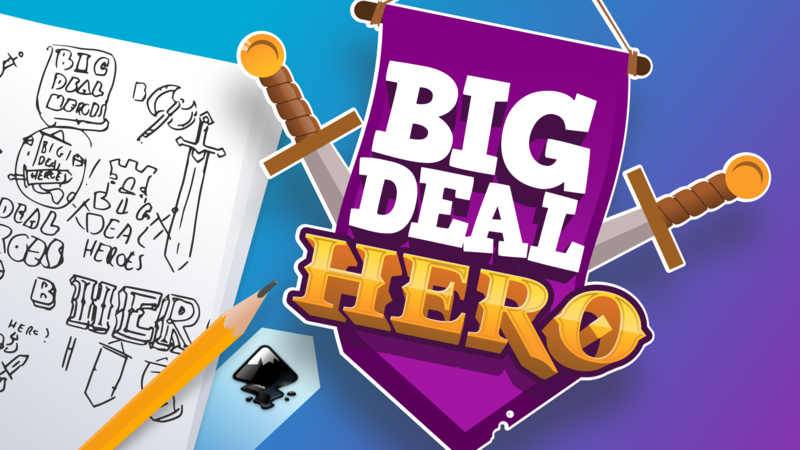 I will tell you every trick I use and every button I push during the course, and show you how Inkscape will help you to create an awesome logo for your game! And what will we create? And a grunge zombie game logo with a huge splatter of blood! Coming in later updates: game app icon designs and more logos on demand! Am I too fast? Am I too slow? Have any questions? Don't hesitate to ask, I am here to teach you logo design! Introduction to game logo design! Being a graphic designer, illustrator and design teacher, I am here to teach you everything I know about logo design, game art and website design. You will learn step by step practical kownledge AND useful design theory as well. You will learn to use Inkscape, this amazing open-source software, and create your own art for free. Follow my courses today and get into the designer mindset! - and please ask if you need help, I am here for you!